Lane reservations must be booked at least two business days in advance and party packages must be booked at least seven business days in advance. 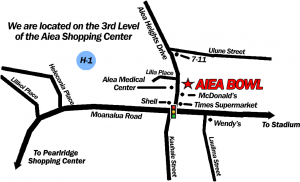 Your reservation is not confirmed until you have been contacted by an Aiea Bowl reservations associate and a deposit has been placed. Our reservation department is open Monday through Friday from 9:00 AM to 5:00 PM. Advertised specials are available on a walk-in, first come, first served basis only. Prices are subject to change without prior notice.